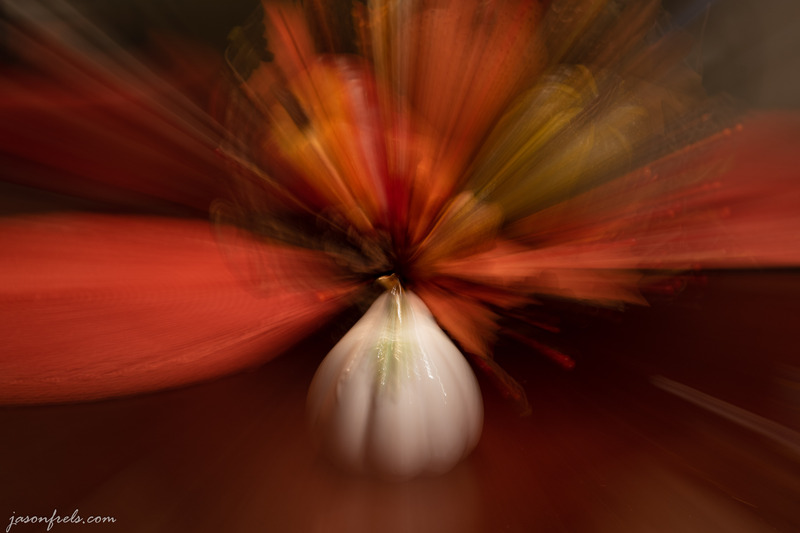 There is a fun effect you can achieve with a zoom lens called zoom burst. This is where you crank the zoom during an exposure to give a motion blur out from the center of the frame. Being trapped in the house on a rainy weekend, I thought that I would try my hand at this. My first subject was a pot of African Violets. It takes a bit of experimentation and practice to get anything recognizable, but you can eventually get a decent looking pictures. Below is the best flower picture that I got. The first thing I found is that it is pointless to attempt this hand held. Between the long shutter speed and manually turning the zoom dial, the camera just moves too much in all directions. So, you definitely need a stable tripod. The second thing that I had to experiment with to get right was finding a focus point. I eventually found that I had to center the flower in the frame and set focus. I did this while zoomed in to 120mm. 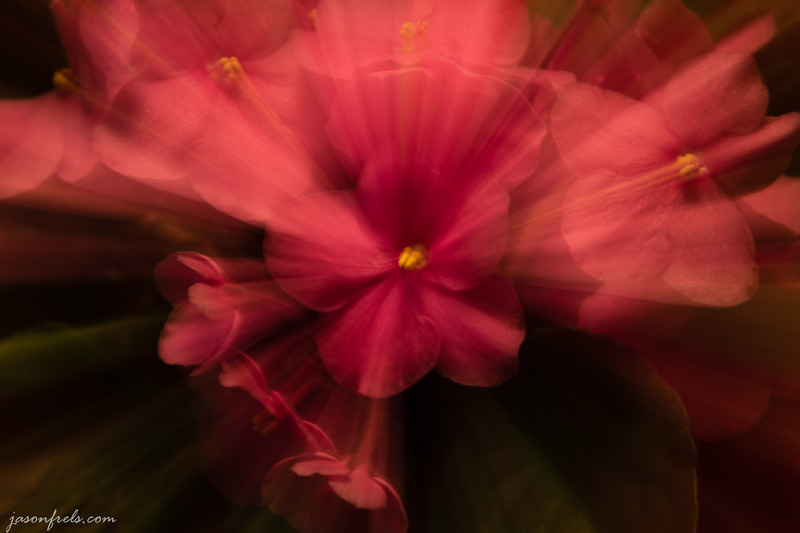 I then zoomed out to 24mm during the exposure, while the flower remained centered and all the motion blur appears to emanate from the center. Next was getting the timing down. This involved a lot of attempts and learning and improving my technique each time. I ended up with exposures of about 2 – 3 seconds. I would release the shutter, wait a beat, and then slowly and smoothly zoom out, trying to time reaching the zoom stop as the shutter closed. With enough patience you can achieve this. The reason for waiting a second before beginning to change the zoom, is to let the main image begin to expose so that it is visible and then everything else will be a linear blur as you turn the zoom ring through the rest of the exposure. In the flower picture above, you can definitely see the center flower at 120mm focal length, and the zoom blur just shows up as motion lines coming out of the flower. I think this came out well. 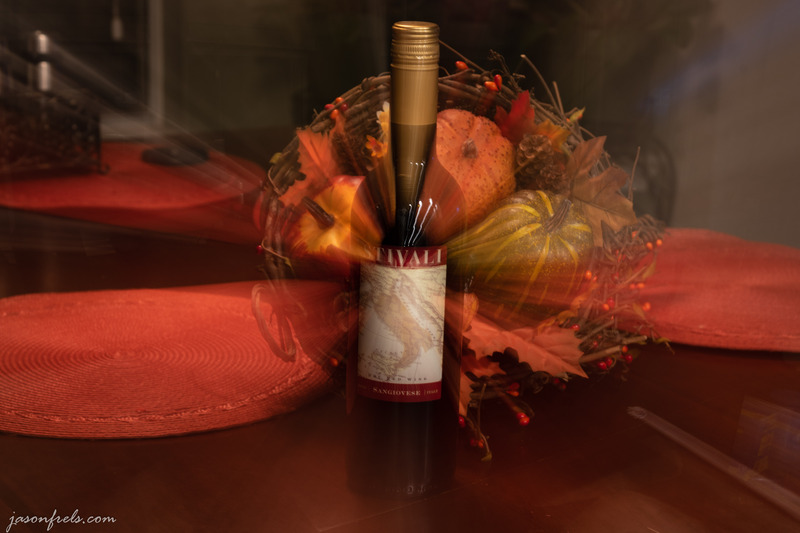 Next, I tried a wine bottle in front of some fall decorations on my table. I probably should have cleaned up the table a bit, or at lease picked up the lens cap sitting in the background. I centered the label of the wine bottle and zoomed out. In reviewing this image, I think that perhaps the wine bottle was too large a subject for this effect to work well. The lines of zoom really only come off the label of the bottle and the rest of it is just kind of there. But, at least I can now drink the Sangiovese. Next I tried a decorative gourd in front of the cornucopia as it was smaller. I focused on the stem zoomed out. I think that this worked better. I got some fantastic zoom lines in the background. I should have gotten that place mat out of the scene, but this was really just goofing around. I didn’t do much post-processing to these photos. I mainly just selected the Lightroom vivid preset and adjusted the exposure. My favorite is the flower picture at the top. I would like to eventually try this with a person if I get any volunteers to be patient while I try this repeatedly to get the right image. Anyway, zoom burst is a fun photography trick to experiment with and doesn’t require a great deal of expertise or equipment, but does require a lot of patience. Looks amazing – very interesting! Love it – especially the first one with the flower. So funny where you mentioned about cleaning up around on the table, happens to me too. I get the good shot and then don’t mind the background because I don’t want to risk not getting the shot again. Interesting and some useful advice, thanks. I’ve seen some night shots using this technique that look quite spectacular. I may have to try this at night somewhere. Good idea. Very nice! I’ll bring this technique with me 🙂 The first one is RAD!